Recently, I’ve been looking at the pros and cons of working with a financial advisor. I have met with a couple of them here and there to get feedback and advice – but have never had a long-term relationship with one. And, picking an advisor is not as easy as it might seem. I really want to know they are in it for my best interests and not how much money they can earn off me. One of the books that has really helped shed some light on investing and picking an advisor is called, The Investment Answer by Gordon Murray and Dan Goldie. And, the best thing about it is that it is short and sweet. I’m not one who gets too impressed with lengthy books, big words and too much to say. And so I was thrilled when I picked up the audio book and it was only two CDs! (The book is 96 pages). This was the authors goal too – to succinctly give regular folks like me an understanding about investing and provide 5 key decisions that need to be made before diving in to the market. I’m not writing a review here – but I just wanted to let you know where I’m getting most of my information about going about selecting an advisor. Murray (a Wall Street executive) and Goldie (a financial advisor) outline two very distinct differences between financial “advisors” and how to go about selecting one. I think one thing that many people struggle with in selecting a financial advisor is the perception that you are handing over the keys to the car (so to speak). And to top it off – there seems to be a cloud of mystery surrounding their fees and how they are going to charge you. No one likes feeling like they might be taken advantage of. I hate that feeling. But there are definitely pluses to working with a financial advisor. Much like you’d go to the doctor for health reasons – you may want to build a relationship with a “money doctor”. Financial advisors often have the knowledge and experience in working with all sorts of financial products and services that you may not have the time to devote to learning. Brokers are the guys you’ll probably want to stay away from. They work on commissions to sell you certain products and will get paid directly from those providers. It is not necessarily in their best interests to look out for your long-term financial well-being – but to sell you more products that affect their bottom line. Their main interests typically lie in the brokerage house who employs them or pays them commissions. Financial Advisors / Planners are (generally) obligated to work in your best interests and will disclose – upfront – fees they will be charging you based on your investments. Fee-only Advisors tend to be the ideal advisor as they can provide you many different financial products and services because they are not tied down to one company or institution. They will work with you in a fiduciary capacity (your interests before theirs) and charge you based on a percentage of your portfolio or upfront fee. In determining which advisor to go with – Murray and Goldie recommend a few guiding principles. Their designation. Many different advisors will have different designations behind their name. Some will be CPA (certified public accountant), CFA (chartered financial analyst), and/or CFP (certified financial planner). You’ll want to ask about their education – and experience. Length of service. Obviously – it’s typically best to go with someone who has a proven track record and years of experience under their belt. With advisors, it’s not always best to go with someone fresh in the field (unless they have years experience in accounting, etc). Ask about their work history. Philosophy of investing. You’ll find many different advisors with differing philosophies on money and investing. Be sure to ask them about theirs and see if they meld with your own. Or, if their philosophies cause any red flags. Fee structure. Don’t be afraid to ask up front about their fee structure – how they earn their money and if they are affiliated with anyone. An independent fee-only advisor will be just that – independent and not affiliated with a larger firm or investment house. It’s generally the advisors who don’t disclose and you never really know how they are getting paid – that you’ll want to stay away from. The good ones will always disclose whenever they recommend a product to you what they will be getting paid from the sale. Typical client. Murray and Goldie recommend clients ask their prospective advisor “Who is your typical client?” Some advisors only deal with the high-buck client. While others prefer to work with a certain profession. You’ll want to be sure you’re not a-typical. Trust. The last factor is certainly not the least. You will be divulging some very personal and important information to your advisor. You’ll want to go into the relationship fully trusting this individual. Check and see if they will give you references of present clients. Or, ask your friends or relatives for recommendations. Do your homework and interview a few prospects. No need to rush. Your advisor is someone who you may want to have a long-term working relationship with. Do you have any recommendations in working with a financial advisor? 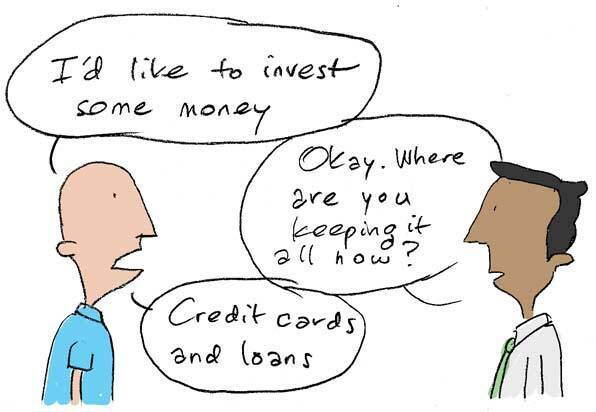 (Note: if you have a lot of debt and limited savings/money available – a financial advisor probably won’t help you much – though they could offer you some good input about planning ahead – ideas for getting out of debt, etc). Great article with some great advice. One minor note: CFA stands for chartered financial analyst. It’s likely the most difficult to obtain in the industry, specializing on advanced monetary topics, highly technical analysis, and complex modeling. It does NOT, on its own, train one to provide comprehensive, personal financial planning and advice, especially in the realms of tax, retirement, and estate planning, fields best left to CFPs. Thanks for the correction Greg and input. I agree that having an advisor which acts as a fiduciary is one of the most important aspects. When interviewing financial advisors a few years ago, I had one person tell me they would put me in one product because they were “required to,” even though I could get the exact same thing from Vanguard with 1% less fees. And he said it with a straight face. @Chad – Yup – I’ll bet that’s pretty common. Vanguard is one of the best products out there in terms of fees. Great article Aaron! I’m currently studying for the CFP looking to add fee-only financial planning to tax prep and planning at our CPA firm. I got tired of doing tax returns for widowed ladies who were sold awful variable annuities by brokers pretending to be financial planners. Your post highlights everything a person should look for in a fee-only planner. Great job! This is great information. I am looking at the possibility of an advisor to get my investments in control. Thanks Grayson. Good luck in finding one! I really liked the Investment Answer. About a year and a half ago, I started working in the finance industry as an office assistant; at the time, I had zero knowledge of finance and investments. My boss gave me a copy of the Investment Answer to help me get started and while I still have a lot to learn, the book helped me better understand what we do and how/why we do what we do. Even if you don’t agree with the book’s philosophy, I think the information is valuable to any beginning investor. I can’t really give any unbiased advice on financial advisors, but I do want to emphasize the importance of using the guiding principles above — and asking any questions a person can think of. The more a person knows, and the more transparent an advisor is, the easier it is to decide if the advisor is trustworthy, and if he/she can help people reach their financial goals. Cool to hear you enjoyed it too Ruser. Transparency is key isn’t it?